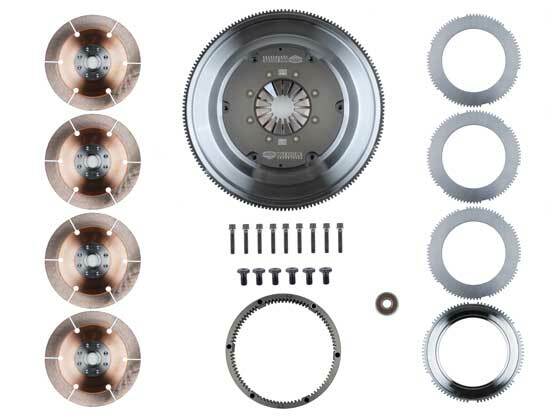 WEDDLE 7.25" 4-PLATE METALLIC RACING CLUTCH PACKAGE FOR AGB/HV WITH CHEVY BELL HSG TO EARLY CHEVY V8 OR V6 WITH 2-PIECE REAR MAIN SEAL PACKAGE INCLUDES: 1 CL7-FW168.CV8 FLYWHEEL 1 CL7-COVER CLUTCH COVER 1 CL7-HSG-1450 HOUSING (OUTER RING) 1 CL7-PP-605 PRESSURE PLATE 3 CL7-FP FLOATER PLATES 1 CL7-DISC-26E CLUTCH DISC 3 CL7-DISC-26N CLUTCH DISCS 1 CL-PILOT-43 PILOT BEARING 6 H-B71620100XHD BOLTS 6 H-BM8X60H BOLTS 6 H-FW8S WASHERS INSTALLATION NOTES: THIS CLUTCH PACKAGE IS DESIGNED FOR .700" CRANK OFFSET AND REQUIRES A 12.7MM THICK SPACER PLATE BETWEEN THE BELL HOUSING AND ENGINE (CL-SPACER-C127 PLUS TWO CL-DOWEL-C150). USE A CONVEX FACE T/O BEARING (SC-00170) AND A 36.4MM SLAVE CYLINDER PISTON (SC-05084). REQUIRES A BLOCK MOUNTED STARTER (910-CHEV).